Osorno Volcano is located in southern Chile. Osorno is one of the most active volcanoes in southern Chile. Historical eruptions have produced lava flows that have entered both Llanquihué and Todos los Santos lakes. The volcano is exclusively basaltic except for two small dacitic domes in the most recent volcanic unit. Charles Darwin, the great naturalist remarked about Osorno "the volcano of Osorno stood out in bold relief; and it was curious to watch, as the sun rose, the outline gradually fading away in the glare of the eastern sky." 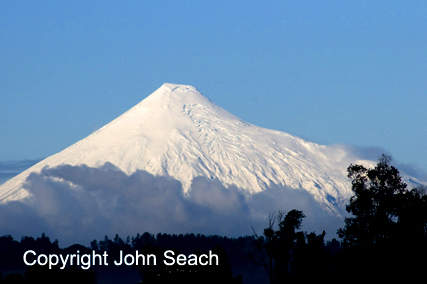 Osorno volcano is best observed in the early morning or late evening when it stands out against a darker background.